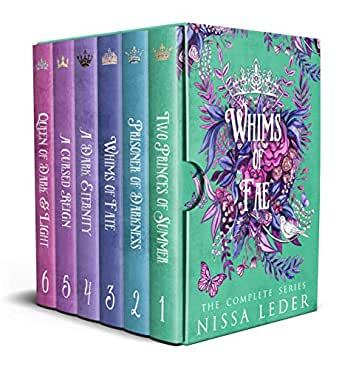 This bundle includes all six books in the Whims of Fae series and is over 1200 pages full of fantasy, romance, magic, and lots of fae. Escaping to Faerie isn't quite the fairy tale Scarlett had hoped for. After her mother's suicide, Scarlett's grief consumes her. When an otherworldly stranger offers her a release from her pain, it’s too tempting an opportunity to resist. She’s lured into Faerie and sucked into a royal battle as two fae brothers prepare for the Battle of Heirs where the winner earns the right to the throne. Human emotion fuels fae power and Scarlett’s is the most potent Cade has ever tasted. He’s certain she is the key to defeating his brother Raith. But Raith has surprises of his own, and Scarlett fits perfectly into his devious plan. Scarlett must decide how far she's willing to go to avoid her guilt and heartache. As she is pulled further into the realm of magic and power, she discovers a dangerous secret that could change her fate forever. Will Scarlett find a way to cope with her sorrow and untangle herself from the two princes? Or will they devour her completely? Find out in this page-turning, fantasy series where a young woman must find light in the darkness. "This introduction to The Whims of Fae exceed even my strongest expectations and I am honestly so, so, so captivated. " "Once I started to read the book, it was very hard to put down." 5.0 out of 5 starsGood stories. Good stories but her writing isn’t close to that if JKR or SJMaas. At any rate - mostly all good endings. 5.0 out of 5 starsAbsolutely worth the read! This box set is great. The characters are well developed, and the story progresses well! It was an absolutely entertaining read. The story line was engaging from the first book to the last! This series is one of my absolute favorites! I wish it could've gone on forever!! Thank you for bring a modern Fae book to life!!! 5.0 out of 5 starsAmazing read couldn’t put it down! I read the sample and just had to get the whole series. I was never let down nor could I put it down. Scarlet is overwhelmed by her depression and guilt after her mother takes her life, making her just want to shut down and wallow. But those feelings make her the perfect target for Cade, a Summer Court Fey who feeds off emotion to recharge his power. When Cade brings Scarlet to the Fey realm, neither of them have any idea the catalyst that this one action will cause. Scarlet will learn some truths and neither the Fey or the human realm will ever be the same. I will admit that I originally pick up the first book, Two Princes of Summer because I loved the cover and I am a total cover snob. I continued reading because I had to know what would happen next (but all the books have gorgeous covers!). What an intense series! The feels that Nissa drags out of her characters and the reader was impressive- and at the same time awful (for me) because when Scarlet feels depressed, I felt like the emotions were so real and raw as if I could almost experience it too. Throughout the duration of the series I feel like there were some amazing highs, usually in stolen moments, and some terrible highs (for the most part in the first book), but anticipation, anxiety,fear and surprise summed up the majority of books. Be ready for mystery, surprise, romance (with just a little bit of steam), magic, danger, deception, court-intrigue, feels, and an epic battle. This review will be on the shorter side (for me since I tend to ramble) since I have no idea how to sum up all the books and the series justice. One thing that I have to say is that where the first book in the series started was nowhere near where it ended and I mean that in the best of ways! The series was so twisty and kept me guessing, relationships were transitional, good guys became bad (I had no idea who I was suppose to root for but I know who I loved! ), bad guys turned questionable, battles were fought for ruling and the ending was just about perfect. Forget what you thought you knew about the Fey because Nissa will spin an entirely new tale that you will not want to miss out on. Side note- Books 1 through 4 are available on audio and I listened to the first book in the series before getting the box set and it was great! So you can listen to the series and read it.